Item # 309720 Stash Points: 1,595 (?) This is the number of points you get in The Zumiez Stash for purchasing this item. Stash points are redeemable for exclusive rewards only available to Zumiez Stash members. To redeem your points check out the rewards catalog on thestash.zumiez.com. Accentuate your personal style with HUF's Plant life White Camo Crew Socks. 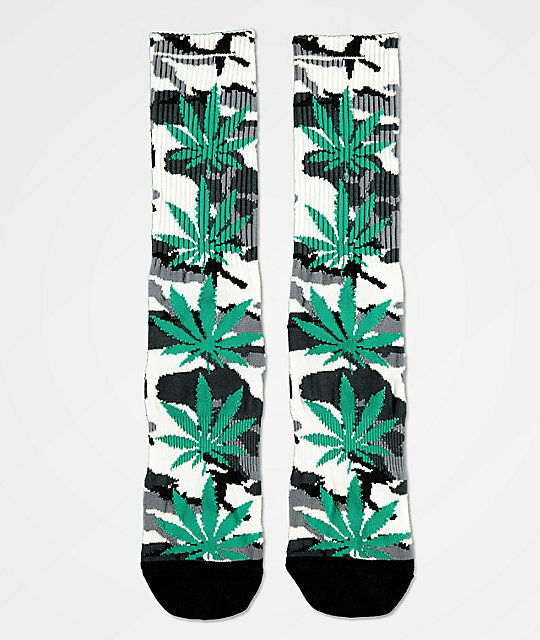 The perfect accessory for showing off your love for the herb, the Plantlife Socks comes in a tri-toned camouflage colorway and display large teal weed leaf graphics throughout. Plantlife White Camo Crew Socks from HUF. White, black and grey camouflage design throughout.